Cape Town - There are more twists and turns in hit drama series Mr Robot (2015-current) than a winding mountain road. Just when you think you know what cyber-security engineer Elliot Alderson (Rami Malek) and his hacker group are going to do… surprise! They do the exact opposite. So why do you need to watch season 1 on ShowMax? It’s got a 97% “fresh” rating on entertainment bible RottenTomatoes.com – that’s higher than epic fantasy show Game Of Thrones (2011-current). It’s won 12 of the 25 awards that it’s been nominated for so far – including two Golden Globes and a prestigious Peabody Award. Plus, it’s got Christian Slater taking on the role of elusive hacker leader Mr Robot! Did someone call the IT guy? Rami Malek looks and sounds awkward. That’s his trademark and it’s what makes him perfect in the lead role. Elliot wants to go to work, do his job and go home with minimum human interaction. He’s depressed, anxious, socially awkward and on medication – and his tics are made worse when he gets drugs (like morphine and un-prescribed pharmaceuticals) from his on-off girlfriend Shayla (Frankie Shaw). He’s the embodiment of a nerdy IT guy. It’s real! Elliot’s hacker gang F.Society is based on real-life hacktivist group Anonymous. They’ve attacked systems and networks around the world, leaking loads of classified information online. And they’ve even been in South Africa – in May this year, Anonymous hacked into the SABC and the government’s websites! On top of that, 95% of the software that Elliot and his IT pals use is real. 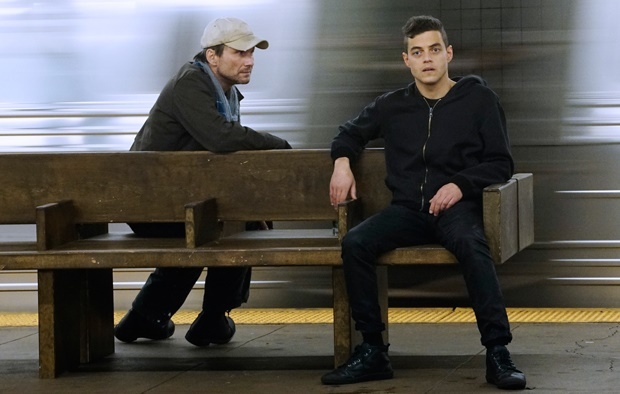 Creator Sam Esmail wanted to make the show as accurate as possible and wanted to show real-world hacking… although it takes a bit longer in real life than just a few keystrokes. Mr Robot isn’t just about how people and technology work together though. It’s about how people interact with each other. Some people are good, some people are bad… and the people who’re left, well, like Elliot and F.Society, they want to level the playing fields by exposing the baddies’ weaknesses. And that’s the biggest problem for Elliot – he’s not sure where he falls but he knows that E Corp, the multinational conglomerate that he works for, are the bad guys and he needs to bring them to justice for their crimes. If you liked 1999 psychological thriller movie Fight Club (with Edward Norton and Brad Pitt), you’ll love Mr Robot. It’s the same “society versus Big Brother” concept, but there are 12 episodes in season 1 alone, so that’s an entire weekend of binge-watching on ShowMax. Start binge-watching the first season of Mr Robot now on ShowMax.com.